It seems like longer than two weeks since I posted my first Impressions from Venezuela, and indeed the time has been full. But there has been one theme which has predominated, at least in my mind: astronomy. Doubtless everyone reading this is aware of the rare astronomical event that occurred last Tuesday. For some reason I cannot remember the circumstances that prevented me from viewing its partner back in 2004, but this time around I was determined to get a glimpse if at all possible. In fact, getting a glimpse was just the problem. 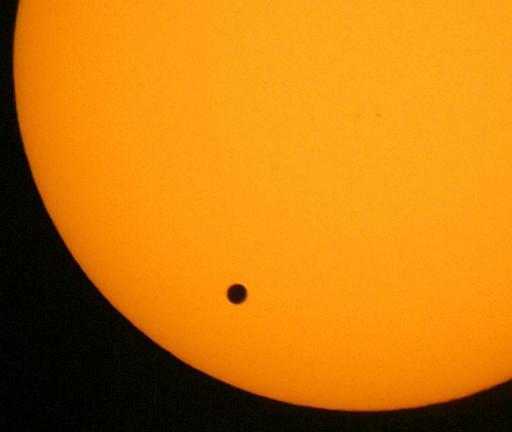 Only the beginning of the transit would be visible from Caracas before the sunset. This meant that a place would have to be found in hilly Caracas with an unobstructed view to the horizon. I had already observed that a couple of tall trees prevented the roof of the Philosophate, where we are staying, from being such a place. We decided that we should make an excursion of it and take the cable car up Mount El Ávila, whence we surely could get the requisite view. The day before the transit, our Jesuit language-programme-coordinator, Jhozman, even obtained a decent Newtonian telescope plus tripod which we hoped to use to project the event onto a screen. But that same day, two spanners landed in the works. The telescope turned out to be missing its eyepiece, and a conflicting event conspired to cancel our journey up the mountain. The former was easily overcome, as the telescope came with a magnifying viewfinder. Using this smaller telescope mounted on the tripod we were able to obtain a reasonable projection of the sun―good enough to see a few sunspots. But we still needed to find a suitable location. Standing on the roof with Jhozman and wondering what to do, I pointed to a nearby apartment building. ‘Of course, if we were on that roof, it would be perfect,’ I thought aloud. Next thing I knew, we were talking to the landlady of the apartment―Johzman was mildly acquainted with a nearby shopkeeper who introduced us. Now, the neighbourhood where we live is pretty dangerous: so much so that we are advised not to go out alone even in broad daylight. So the landlady was pretty reluctant at our request to admit four male strangers into her building. But Jhozman has a silver tongue. He explained that we were Jesuits, that I was an astronomer from Canada who needed to make an observation vital to the continuation of all modern science, and that her building was the only suitable location in the neighbourhood. Somewhat reluctantly, she agreed that we could come later that afternoon. It was a cloudy afternoon, and I feared that our efforts would not be rewarded. But by five o'clock the west was relatively clear. The three Canadians (Jhozman had an engagement elsewhere) were admitted into the apartment, again with an air of suspicion. The landlady made us promise not to look over the edge of the roof lest the tenants see us. I set up the apparatus and we waited. Venezuela, thanks to one of Chávez’s relatively recent initiatives, has its own time zone half-an-hour off from its neighbours. Thus, unlike in most of the world, the transit was set to begin at thirty-nine minutes after the hour, local time, rather than nine. We didn’t see Venus immediately at 5:39, but after a couple of minutes, I descried a small dimple on the north-west side of our image of the sun. With time it grew, and by sunset less than half-an-hour later, it was about its own diameter within the sun’s disc. In the meantime, the landlady came up to join us, and soon her daughter, her son, a neighbour’s son and her husband. They were curious to see the spectacle and we began talking. We pointed out our own house, which was a stone’s throw away. By the time the sun set, the initial suspicion had vanished and we had all become friends. She invited us to her place for a drink, and when we left, insisted that we conceal our tripod in a large plastic bag. At that time of the evening (even though still quite light outside), she said, carrying any unusual object was sure to attract unwanted attention. And so we headed home, having seen what no one alive today will likely see again. This past weekend (which we extended to four days), we visited the city of Merida, about seven hundred kilometres inland of Caracas, nestled in the Venezuelan Andes. The Jesuits have a large property outside the city on which is situated a very handsome retreat house and a couple of schools. One of these, San Javier del Valle High School, is prominent for being the first Fe y Alegría school to start what is now a very widespread technical training programme. Perhaps I can say more about Fe y Alegría in the future, but for now, I will mention that it is a huge network of schools and educational centres, started by the Jesuits here in Venezuela and now present in several countries. It primarily serves students from low-income families and to date has more than a million (sic!) alumni. San Javier is a wonderful school. Besides its incredible vista (including the summit of Pico Bolívar ―unfortunately covered by clouds our entire stay), the students we met were very fine young men and women. But to return to the astronomy theme. Merida is the home of Venezuela’s Centro de Investigaciones de Astronomía (CIDA) ― not to be confused with the Canadian agency bearing the same acronym. Jhozman, once again using my credentials as an astronomer, had contacted CIDA and arranged with one of the fellows for us to have a tour of their observatory. The drive alone made the visit to the observatory worthwhile. We wended our way up verdant hills along twisting switch-backs, passing through touristy villages, until, after two hours, we caught sight of four domes on the gentle peak of a mountain. At 3600 metres in altitude, it is no Cerro Toco, but is still one of the higher observatories in the world. The telescopes were build back in the nineteen-fifties and delivered to Caracas. However, due to complications related to a regime change, they ended up gathering dust in a port warehouse for about twenty years. It was only in the seventies that they were taken out of storage, transported to the Andes and all assembled for the first time. Perhaps surprisingly, only a few missing pieces had to be replaced. We had a wonderful, detailed tour of the facilities, and were even treated to supper in the observers’ residence. Though it was cloudy our whole time there, seeing the instruments was enough to keep us occupied―besides, despite popular imagination, modern, scientific-grade telescopes are not fitted with eyepieces for human observers. We stayed a few hours and returned to Merida close to midnight. The day before we left, we invited our new astronomer friend to come visit us at the high school. After showing her around, we treated her to luncheon at a charming restaurant near the college that serves excellent river trout. Our guest was delighted to have reconnected with the Jesuits, for when she was a student she had attended the Vatican Observatory Summer School. She spoke fondly of her experience there and told us that CIDA still sends one or two students to the school most years that it is offered. Then we discussed possible opportunities for the students of the high school to interact with CIDA. Who knows, but perhaps one of the students we met last weekend will one day be a telescope technician at the observatory. On Sunday evening we returned overnight to Caracas. It ended up being a very long trip (almost twenty hours all told). This was chiefly because we needed to switch buses along the way. Additionally, the roads were flowing with Chávez supporters travelling Caracas to support his registration for the upcoming election. On the highway we passed literally scores of buses loaded with people wearing red shirts and caps. Socialist slogans were scrawled on the bus windows. In down-town Caracas traffic had come to a standstill, to such an extent that we had to walk the last kilometre or so home. But I have already written enough for this post; I shall have to save a discussion of the political situation for a future post.